Hepatitis B Virus is already one of the most important viruses that are infectious to man. It is estimated that more than 240 million people have chronic (long-term) Hepatitis B Virus infections and more than 780,000 people die every year due to the acute or chronic consequences of Hepatitis B. It certainly has the potential to mutate and evolve into new and potentially deadly variants..
Scientists were worried that Hepatitis B Virus could exist in animals that are destined to end up as food on our dinner plates. If, for instance, Hepatitis B Virus could be detected in chicken, it would potentially give the virus a chance to infect people or a novel virus could emerge that is a mix of both human and chicken variants. A study was done to see if Hepatitis B Virus could be detected in liver and serum samples of chickens. The result were alarming: a large number of chicken were or had once been infected with Hepatitis B Virus. DNA sequencing revealed that two Hepatitis B Viruses, found in chicken livers, shared 92.2% of a known human Hepatitis B Virus strain and 97.9% nucleotide sequence of another human Hepatitis B Virus strain. The results of the research showed the existence of Hepatitis B Virus in chickens and it was a just a little bit different from human variants. Not quite the same means that the existing vaccine for humans is useless. 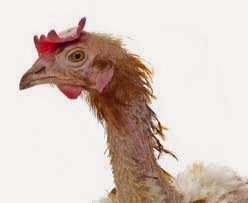 This would present a significant risk to people who work with live chickens or chicken products. WHO: Hepatitis B Factsheet. See here.